One of the most frequently asked questions that I get from people once they hear everything that I’m currently unable to eat (thanks stomach!) is, “What in the world do you eat for breakfast if you can’t eat eggs?” My answer is Bacon, bacon and more BACON! Just kidding. Kind of. While I do often enjoy some bacon in the morning, because let’s face it, it has it’s own food group in my book, I do need some other foods to fill me up in the morning. I often have a smoothie which contains many of my supplements that I need to have each morning, but being on a low fruit intake diet at the moment does not make smoothie drinking super enjoyable. Another morning favorite is my gluten-free oatmeal with some apple, spices and almonds. I end up eating oatmeal a good 2-3 times a week. But my favorite is any kind of potato hash.. and those are normally reserved for the weekend! Potato hashes are great for breakfast because you can use whatever you have on hand – leftover meat, veggies, fruit… just clean out that fridge! – AND they are basically guaranteed to fill you up! I personally love my potato hashes LOADED with vegetables. While other members of my household (cough *Michael* cough) are not as much of a fan of the ridiculous amounts of vegetables I like to shove in there. So this sweet potato, apple and sausage breakfast hash was a happy compromise. Filled with onions, peppers, red potatoes, sweet potatoes, apples and sausage, this breakfast hash is super easy to make and will be sure to keep you full all morning long! I love using both sweet potatoes and red potatoes in this recipe because the apples are sweet already, so the red potatoes are great to cut a little bit of that sweetness. Sweet potatoes and apples only is just a tad bit of sweetness overload for me! You could customize this hash easily by adding an egg on top for extra protein, maybe adding some white cheddar cheese, or even adding diced bacon! Because bacon makes everything better, right? 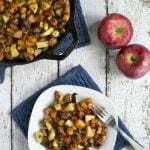 This sweet potato apple sausage breakfast hash tastes just like fall. Full of sweet potatoes, crisp apples, onion, bell peppers and fresh herbs, this is one gluten-free breakfast you do not want to miss. Gluten-free and dairy-free. In a large skillet, heat olive oil. Add onions and bell peppers to the skillet and cook 5 or so minutes, until starting to soften. Add sweet potatoes, red potatoes and sausage and cook until sweet potatoes are starting to get soft, at least 10 minutes, and the sausage is browning on the outside (remember they are already cooked!). Stir in apples and cook for 3-4 minutes, until apples are starting to soften but still have a little bit of bite to them. Mix in salt, pepper and fresh rosemary. Yay!!! I hope you like it!